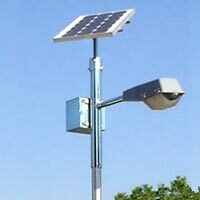 We are regarded as well-acknowledged Solar Lighting System Manufacturer, Exporter and Supplier in Mumbai, Maharashtra. We offer an extensive array of Solar Lighting System that comprises of Solar Home Lighting System and Solar Street Lighting System. Our Solar Lighting System is very efficient in cutting electricity cost in sectors where there is a huge requirement of energy. Clients can get Solar Lighting System from us at competitive rates.